Robert West Thornton was the son of the Deputy Provincial Grand Master for Sussex. He was commissioned in September 1914 and killed at the Battle of Bellewaarde near Ypres on 16 June 1915. Robert West Thornton (known as “Bobby”) was born at New Town, near Uckfield in Sussex, on 26 January 1896, the first son of Robert Lawrence Thornton (1865–1947) and his wife Charlotte née Raynes (1866–1961). At the time of his son’s birth, Robert Lawrence Thornton was a barrister and J.P., who would later become the chairman of East Sussex County Council and the Provincial Grand Master for the Sussex masonic province, and be appointed C.B.E. in 1920. The family lived at High Cross, about 1½ miles south of the village of Framfield, near Uckfield. Robert was educated at Eton College from 1908 to 1913, where he was a member of the Officer Training Corps. In November 1913, he was accepted into the Royal Military Academy at Sandhurst. Within three months, Robert had done so well at Sandhurst that he was made an NCO Cadet. Robert’s father, Robert Lawrence Thornton was an eminent Freemason who had been appointed Deputy Provincial Grand Master for Sussex in 1912, and in 1892 was the founder Worshipful Master of Loxfield Lodge No 2450, meeting at Uckfield. Robert was initiated into the lodge on 28 January 1914, two days after his 18th birthday. Initiated on the same evening was 37-year old solicitor, George Herbert Thorn. Robert was passed to the second degree on 24 July 1914 and raised to the degree of a Master Mason on 14 November 1914. When war was declared in August 1914, Robert was still training at Sandhurst and it was not until 1 October that he received his commission, as a Second Lieutenant into The Royal Fusiliers (City of London Regiment), for which he was recommended by Major-General Sir Geoffrey Barton. In late November, he was posted to join the 4th Battalion (part of the 9th Brigade, 3rd Division of the British Expeditionary Force) and sent to Flanders. Up to the present time, battalion has lost about 1900 NCOs and men, and over 50 officers killed, wounded, missing or sick during the campaign. All officers of the battalion except Adjutant O’Donel & 2nd Lt Maclean were killed, wounded or missing. Robert reached the battalion on 1/2 December, when they were in billets at Westoutre, about 13km south-west of Ypres, close to the French border. The battalion was gradually reinforced in December, and alternated between periods in billets and periods in the trenches near Kemmel. The trenches were in poor condition and regularly flooded in the heavy rain, with the men often up to their knees in water, resulting in a great deal of sickness. Christmas Day 1914 was spent in billets at Locre (4km west of Kemmel) before returning to the trenches on New Year’s Day. They remained in the Kemmel area until 17 February when they were ordered to return to Ypres, to take up positions in the trenches to the south of the town. The trenches here were as bad as those at Kemmel (“quite neglected”) and the men were “demoralised”, particularly with the large number of dead bodies “lying about all over the place” still unburied from earlier engagements. 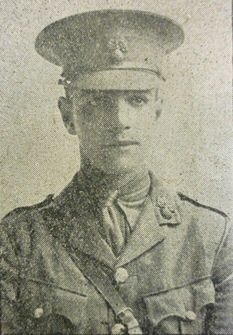 On 11 February, Robert was promoted to Temporary Lieutenant. On the night of 21/22 February, the battalion suffered further heavy casualties, with 58 men killed or wounded within 48 hours. On 4 March, the battalion was withdrawn from the front line and moved to the rest area near Ouderdom, 8km west of Ypres. Even here, they could not escape from the rain and mud. The huts were not rain-proof and the whole area was a sea of mud. the only thing to do, as the enemy was gaining the upper hand in the sector, was to send up a really good brigade to Ypres, one that could really be relied on. Gentlemen, you have restored the situation, and I thank you all. Two days later, the battalion returned to the front line to take up the trenches south-east of Ypres, near St. Eloi. Over the next seven weeks, until early June, the battalion alternated between periods in the trenches and periods in billets. Although there were frequent reports of heavy artillery fire to the north and east of Ypres, the war diary generally reports that this was a “quiet” period for the battalion, with light casualties. In a letter to his parents in April 1915, Robert said that, with the exception of the adjutant, he had been “out there” longer than any other officer in his regiment. On 5 April 1915, he was Mentioned in Despatches by Field Marshall Sir John French, commander of the BEF. On 2 June, the battalion were ordered “to go and help out the cavalry at Zouave Wood”, near Ypres. The next few days were spent in trenches near Hooge Chateau, with several casualties from “whizz bangs” and sniper’s bullets. who spoke in eulogistic terms about the good work done by the 9th Brigade in the past, saying he knew that the Brigade would do the task set them on the following Wednesday and relied on them to carry it to a successful issue. The chief advantage of my appointment is that I get a jolly good horse, and the pick of the men. We do a big show tomorrow morning. I hope to goodness it will be successful. I think we shall give a good account of ourselves. In early June 1915, the Germans controlled a salient around Hooge, to the north of the Menin Road, about 5km east of Ypres. The Bellewaarde Ridge stood just behind the lines, giving the enemy good observation over the British lines. The 9th Brigade was ordered to attack the salient and take control of the ridge. The attack was to commence early on Wednesday 16 June, with the 4th Royal Fusiliers on the right of the attack. Our artillery commenced bombardment (shelling) of German trenches at 02:50 and continued with the exception of two short intervals till 4:15, when our first line jumped off the mark and got through the Germans and into their trench in a marvellous manner. The men were so eager that they went forward a great deal too fast into the second and third German trenches, only to be mown down by our own artillery. Having lost a number of officers and men, we withdrew and took a line in a communication trench that Captain Delaperrelle had taken up and turned into a fire trench. This was consolidated and held against all counter-attacks and frontal attacks, as well as a bomb attack on the right until told to leave the trench after 12:00. The Brigadier of the 7th Brigade took over at 10.00 and ordered the CO, Major R G Hely-Hutchinson to go into the wood we had just captured and reorganise the men that remained. This was done immediately – these men were subjected to heavy shelling all day – casualties were appalling. The Adjutant, Captain G Thomas O’Donel, was killed with his orderlies and operators by a high explosive shell. The heavy shelling that the Germans were subjected to had a most demoralising effect on them. Our men acted splendidly – their eagerness cost them a number of casualties. We lost fifteen officers. Despite their early success, the assault was a failure with heavy loss of life. At the end of the day the 3rd Division had lost 140 officers and 3391 men, two-thirds of which were sustained by the 9th Brigade. Of the 22 officers and 820 men from the 4th Battalion who went into the attack, 15 officers and 376 men were killed wounded or missing at the end of the day. Sadly, on the day that his parents received his last letter, they also received a telegram containing the tragic news that Robert was amongst those who been killed on 16 June 1915. He had charge of the machine guns, and was doing very good work when he was shot through the heart. The battalion was in a big charge at the time, and I am sorry to say there are not many left now. We have only six officers that came back; but I am sorry that Lieutenant Thornton was with the killed. He was always looked upon as a very good officer, and all the company are sorry that it has happened. The Commanding Officer would like you to know that he had sent in your boy’s name for the Military Cross a couple of days before he died and that he knows the General recommended it and sent it on. It will probably not have got through in time. We were all most awfully fond of your boy, he was always so cheery and bright; I also had – as his Commanding Officer – the highest opinion of his abilities as an officer, and looked on him as quite in a class by himself. He was very clear headed and quick at taking in a situation, and carrying on and doing the right thing. When I was in Ypres I met a great friend of mine, and he told me of a certain young subaltern in his Battalion, the 4th Royal Fusiliers, who at the age of nineteen was commanding a Company, and doing so well that although there were more senior and older men available the Colonel refused to put them over his head. I asked who the lad was, and was told it was Bobbie Thornton. He had the knack of getting men to work and to fight. He was a real good ‘un and brave as a lion. One of the cheeriest souls that ever lived, your boy must have been a treasure in his battalion. Here he was always so bright and full of fun that a conversation with him always did me good. As the War office had not specifically confirmed the recommendation for the Military Cross, Dr. Eyre refused to sanction the proposed wording on the memorial As a consequence, Major & Mrs. Thornton left the congregation at Framfield and decided to attend St. Michael and All Angels at Little Horsted, approximately 2 miles from High Cross. On Sunday 17 June 1917, on the second anniversary of his death, a rood screen in his memory was donated by the family to Little Horsted church. The screen was erected under the chancel arch and dedicated in a service conducted by the Bishop of Lewes, The Right Reverend Herbert Jones. The screen was designed by Frederick Charles Eden of Grays Inn Square, London and the centrepiece represents Christ on the Cross, with figures of the Blessed Virgin and St. John on the sides. A brass plaque was fixed on the wall alongside which included the reference to the Military Cross as wished for by the family. Revd. Eyre retired in 1925/26, and was replaced by Revd. Arthur Haire, who was prepared to agree to the family’s wishes. On 8 April 1928, a memorial tablet to Robert was unveiled and dedicated in Framfield church by Revd. Haire. Robert is also commemorated on the war memorials at Framfield and Little Horsted churches. In June 2008, Robert’s sword was acquired at auction by a collector, John Hart. 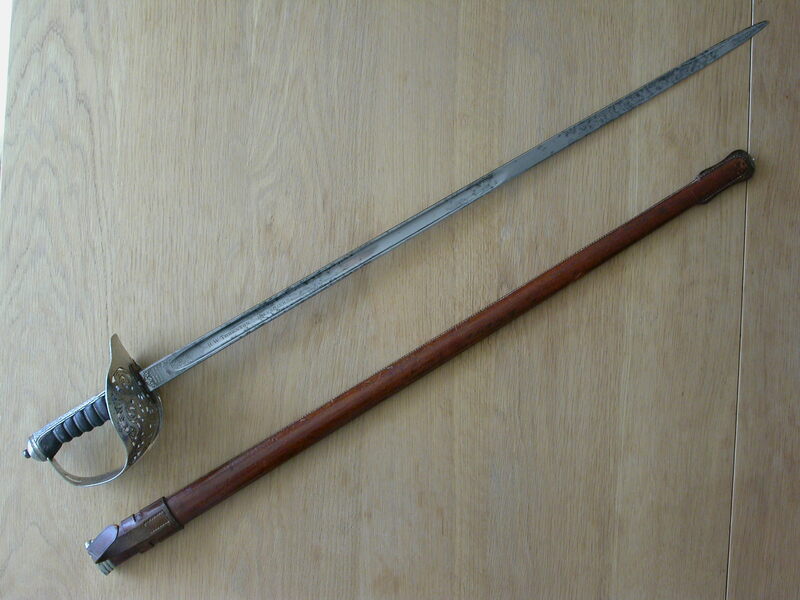 The sword, described as a “wartime economy” P1897 infantry sword, serial numbered 45161, has since been restored by John to something close to its former glory. 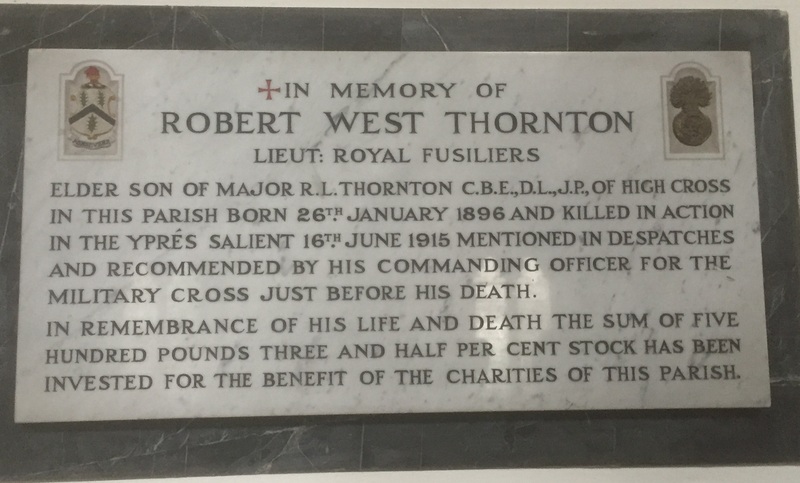 WO 339/15798 Lieutenant Robert West Thornton. The Royal Fusiliers (City of London Regiment). WO 95/1431/1 War diaries: 9th Infantry Brigade: 4th Battalion Royal Fusiliers.